Welcome back welcome back! This week we have a whole 3 new comic reviews to bring to you. Our good friends at Vibranium comics hooked us up this week with some good and some not so good comics, so pay attention boys and girls and you may find something you like…or be saved from something a bit so-so. Again, I want to thank Vibranium for their continued support of our blogs and for supporting us in our Relay for Life for this year. If you’d be interested in supporting us in Relay for Life this year just go to the following link http://main.acsevents.org/goto/draxisweb and make a donation or buy a shirt from our Cancel Cancer site (http://draxisweb/CancelCancer ). As always, show our sponsors some lovin by visiting their facebook site linked to the banner above to see events and new posts or check out their webpage linked to the banner at the end of this blog. Normally, we have a lot of winners in this review. Some would wonder if I just like everything that comes our way, but I assure you there are things that I don’t like and this blog here will highlight the fact that I don’t like everything I am given to review or everything I pick up to read. So let me start off by saying I LOVE Archie….from the 90’s. I have not really kept up with Archie lately but for the most part I don’t like the changes I see. However, don’t let this fool you. I am open to new types of Archie comics and good crossovers. I quite enjoyed the Betty and Veronica Vixens and I loved the start of Harley and Ivy Meet Betty and Veronica. This week we find ourselves with the first issue of Vampironica. That’s right, a mashup of Vampire and Veronica. Both of which I usually love. So let’s jump right in. First, I found the comic to be too short. Now I haven’t counted the pages but just upon reading it it seemed shorter than most comics. It flew by and really felt short. In my opinion, the story was a bit lacking but perhaps that’s because it was short? To me the story felt rushed and hollow and very one dimensional. The start of Harley and Ivy had a hundred times more quality story to it than this did. The whole story was just “Hey Vampire’s here lets have it bite Veronica and see what happens.” No reasons for anything…just a wrong time and wrong place and the ability to fight back type of story. The art work wasn’t much to my liking either as it had too many odd shadows and too dark. I know this is a horror comic, but the whole thing just wasn’t to my liking. I honestly did not find a single redeeming thing about this comic. In my opinion, this Archie spinoff is not worth the time or money. However, don’t let this deter you from the shop this week as there are other things that are worth your time and there are plenty of comics to find and enjoy. This has been the first Archie Undead comic I have read. Do you have any stories of the other books? Did you enjoy them or did they fall flat like this one? Leave your thoughts and experiences below in the comments! I read all the Archie horror comics and so far this is the title I like best. Afterlife with Archie, Chilling Adventures of Sabrina and Jughead: The Hunger are entertaining but they change so much of the canon (not just by adding horror stuff either) they might as have been written as non Archie stories. Vampironica so far actually feels like it could come straight from classic Archie so the door is open for real insight into the characters. 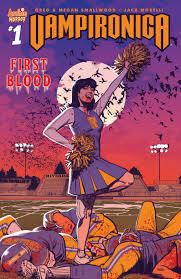 Well in my opinion, vampironica is not that bad. I mean, I love the setting and the fact that there’s this hunger and ability to fight back just makes the whole thing really interesting. It’s a cool series and I enjoyed it.